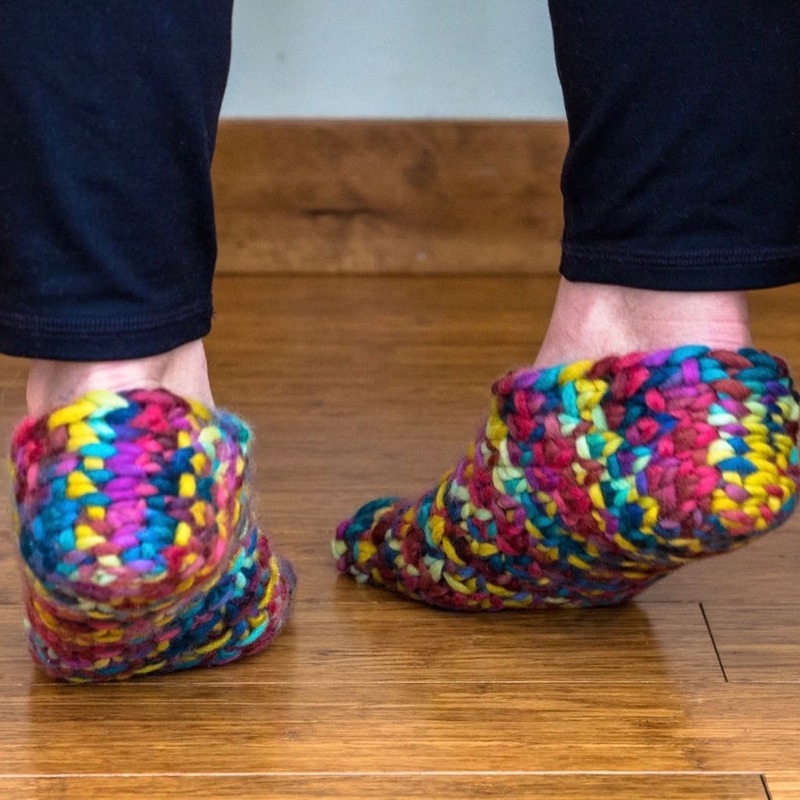 These slippers (and the hat to match) were inspired by so many things; the fabulously fat and squishy super-bullky-weight yarn; the cooling of the days and nights, and my resulting desire for toasty warm snuggly knitted things; and finally, my very recent reading of Elizabeth Gilbert’s Big Magic. 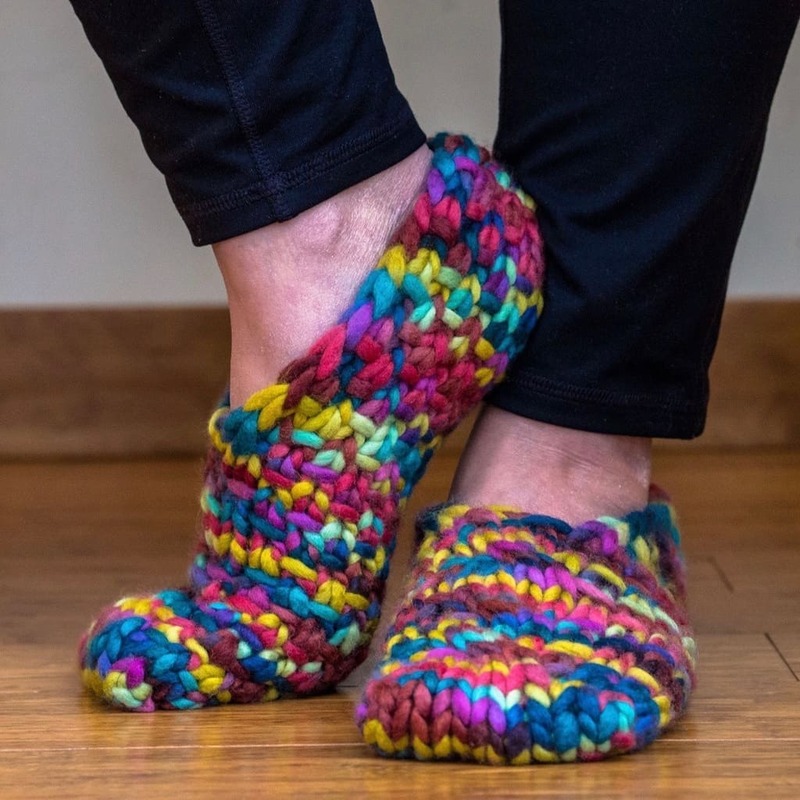 “One of the oldest and most generous tricks that the universe plays on human beings is to bury strange jewels within us all, and then stand back to see if we can ever find them.” Now, these slippers might not bring out those strange jewels hidden within yourself, but the comfort you receive from the making, gifting, and wearing of them might just inspire some of that within yourself. Finished Measurements: Small (medium, large): 6 (8, 10)” inside-of-slipper circumference on foot, measured after blocking. Foot length depends on recipient’s foot size – see chart for approximate foot lengths. These slippers are very stretchy. Yarn: approximately 60 (70, 80) yards super-bulky-weight yarn. I used Blue Moon Fiber Arts Sookie in Hanging with my Gnomies. Gauge: 10 sts & 18 rows = 4”/10 cm in modified linen stitch.